Through captivating 3D views and life size visualisations, The Virtual Environment Radiotherapy Treatment laboratory (VERT) is an excellent platform for supplying therapeutic radiography training to students, as it provides the opportunity to learn clinical techniques without the stress and time constraints of a real clinical environment. The virtual machine can be moved and orientated in much the same way as an actual treatment machine and it ensures students are able to transfer skills and knowledge gained using VERT to their placements and, later on, in their careers. Whereas previously it would have taken students some time to become proficient in manipulating the treatment equipment, they are now able to do this after just one week's training and two weeks' experience using VERT. The virtual world has an advantage over the real since it is possible to see a virtual patient's internal organs in the form of computed tomography (CT) scans. It is even possible to visualise the dose that the virtual patient will receive, usually students and dosimetry staff in hospitals are only able to see this on a computer monitor. In the VERT suite students walk round the patient and observe the way the radiation interacts with tissue from all directions hence they can critically evaluate the radiotherapy plans in detail. As a learning tool, VERT is used as a powerful visual aid for demonstrating anatomy, radiotherapy plans, radiation dose distribution and a wide variety of treatment techniques. 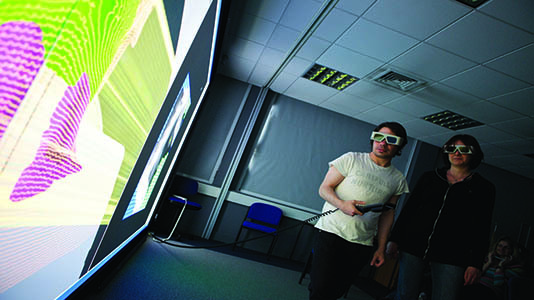 It is used throughout the training of pre-registration therapeutic radiography students at LSBU who by immersing themselves in a 3D virtual reality training system become familiar with radiotherapy techniques and technology. This space is used continuously throughout training, providing students with practice without risking harm to patient or equipment. Specifically designed as a learning and skills training tool for students, VERT aims to make learning more effective and enjoyable. For our first year students, an entire week prior to their first clinical placement is dedicated to pre-clinical preparation. During this week, students are provided with the opportunity to learn the basic controls of a linear accelerator hand pendant and the virtual machine. Students are shown the differences in the variety of linear accelerators and their respective hand pendants and learn the basic skills of switching the room lights and lasers on and learn the concept of an isocentre. Students are taught the names of the different components of linear accelerator and learn how to move them independently using the hand pendant; such as the gantry, collimator and treatment couch. These are basic skills and concepts that the student can then transfer to the clinical environment during their first placement, embedding their learning and providing a crucial link between theory and practice.